As publishers and new media companies try to tap into the potential offered by the iPad, many have decided that offering richer, multimedia-laden experiences is the way to go. Yesterday, Push Pop Press was acquired by Facebook in what appears to be a talent acquisition. According to a post on the company website, “we’re taking our publishing technology and everything we’ve learned and are setting off to help design the world’s largest book, Facebook.” By all appearances, there’s a reason for this: Push Pop Press’ vision for traditional publications, as appealing as it might be on paper, simply hasn’t taken off. At the same time, however, one traditional publication is thriving with a much simpler model. As revealed in a New York Times article, The New Yorker is doing quite well without turning its iPad version into a feast for the senses. Approximately 20,000 of the 100,000 readers who read The New Yorker iPad app paid $59.99/year for a subscription, and “several thousand more” pay $4.99/week for single issues. As The New York Times’ Jeremy W. Peters notes, “When magazine publishers began pouring their resources and hopes into the iPad, their thinking was that readers wanted something substantially more than just words on a screen. A simple PDF of a page just would not do.” Such assumptions may have been wrong. The key point: it’s all about value. Traditional publishers thinking more about the iPad’s capabilities than what their readers expect on the iPad are more likely to produce a tablet publication that produces more interest from industry folk than it does interest from actual readers. In many cases, attempts at impressing the critics leave readers dissatisfied. Though the vast majority of companies see the importance of mobile trends, measurement is an issue, with just 24% measuring the value of mobile traffic. This finding comes from our Quarterly Digital Intelligence Briefing, sponsored by Adobe, which looks at key trends affecting digital marketers. 900 businesses were surveyed for the report, and one key trend that emerged was measuring the value of the mobile channel. The use of mobile for emails continues to grow with stats suggesting that it accounts for up to 30% of email openings. 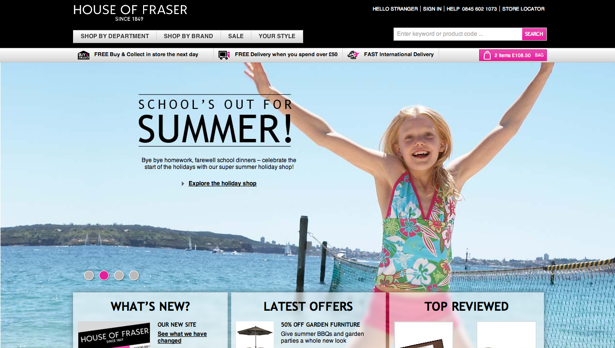 House of Fraser unveiled an updated version of its website recently. Online sales rose by 110% in the first 24 weeks of the year, and House of Fraser aims to continue this growth with the redesigned website. The previous incarnation, as reviewed here by Paul Rouke in 2007, was a good site, but the new version provides a more up to date, streamlined look.